The Partners For Our Communities (POC) ICompete Northeast Palatine Summer Camp is a unique partnership of several public and private entities coming together in a spirit of cooperation to give over 100 at-risk, low-income youth in Palatine the opportunity to enjoy three full weeks of summer day camp. Participants range in age from 7-14 with several past camp participants who volunteer as junior counselors. 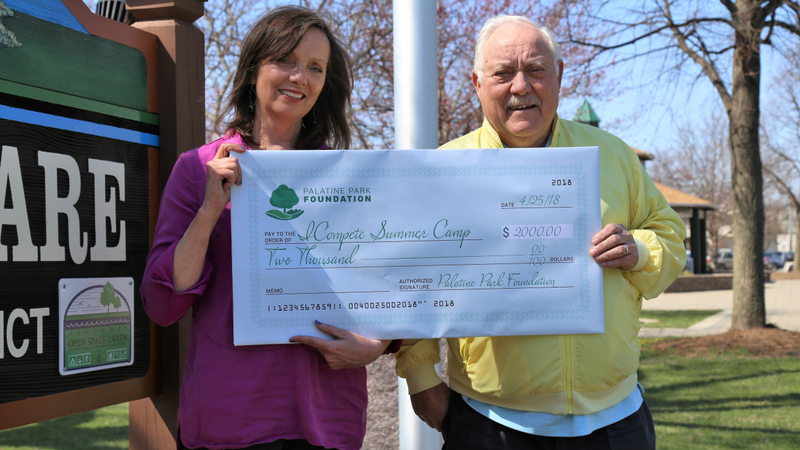 Over 150 volunteers from area businesses and organizations provide mentoring and support, including Palatine Park Foundation who has recently donated $2,000 towards this program. Palatine Park Foundation was formed in October of 1994 to assist the Palatine Park District in its continuing commitments of service to the community. The vision of the Park Foundation is to contribute to the health and well-being of the Palatine Park District residents, provide program scholarship opportunities to residents with financial limitations, assist in the funding of projects or events that provide physical accessibility to all, and preserve open space throughout Palatine Park District. The Foundation offers several ways to support efforts to serve the Palatine community. “Fling, Swing, Kick” is a new Park Foundation event being held Saturday, May 19th at Palatine Hills Golf Course, 512 W. Northwest Highway, in Palatine. Join the Palatine Park Foundation for a family event for ages 12 and up to raise funds for the Foundation’s Scholarship Program. Events include a 9-hole golf scramble, 9-hole FootGolf, and disc golf. For $40.00 per person, the event includes one sport option and BBQ buffet with soft drinks. A cash bar will be available and a variety of raffles and auctions will be offered. ICompete is a collaborative partnership with Palatine Park District, Partners for Our Community (POC), Palatine High School, Community Consolidated School District 15, Palatine Police Department, and Palatine Township. Each partner plays a unique and integral role in the development, implementation, funding, and support of ICompete programs. Annually, ICompete offers a variety of programs to the Palatine community. Each program is designed to offer academic assistance or exposure to new opportunities. In doing this, ICompete works hard at building strong leaders and healthy youth. All the ICompete programs are designed to be free or affordable to families. ICompete has grown over the last ten years with the dedication of partners, staff, committee members, and donors. ICompete is a partner of Palatine Park District. The ICompete mission is to introduce underserved families to athletics, arts, and academics by breaking down the barriers of access to better prepare for life experiences. The goal is to stimulate interest, provide academic support, and increase opportunities to participate in organized sports, clubs or community programs. Because of the tremendous support with our partners, the lives of these families are being changed, challenged, and improved. ICompete Programs allow participants to develop the skills to make safe choices, get involved in their school and community, and learn how to be competitive in this ever-changing, complex world.